Today is the start of a new series on the blog, Fashion Inspiration Friday (FIF). I figured what better day to put up some fashion inspiration than right when the weekend starts. I 'm always looking for new ideas of pieces that could go together, especially when going out. So thats what this series would be about. Todays FIF is about the casual, but still put-together look. I love me some heels and being a city girl we practically grow up in heels, but I love the pointed toe pump, there is just something so classic about this shoes. I think heels can take an everyday outfit to the next level. 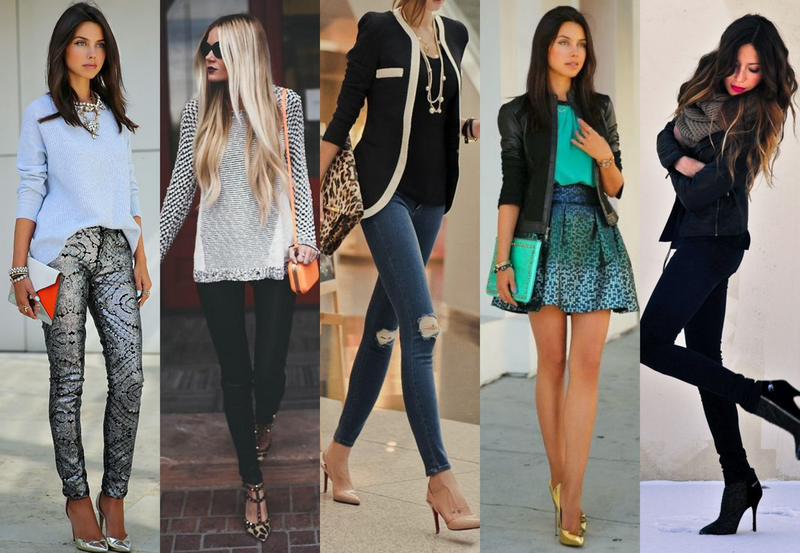 I love the skinny jeans and loose top with heels look, this is my safe go to look [it can never fail]. What are some of your fashion inspirations? Have a great day and lovely weekend! 10 comments on "FIF: Fashion Inspiration Friday"
Gorgeous inspiration. A pair of amazing heels can pull together any outfit! Love the outfits! Especially the third and last one! All the outfits look lovely, but I especially love the first one. The heels do make an outfit look really sophisticated. I cant wear heels due to my AS but I love to see others wearing them. I love the pants in the first outfit.